A window named "New Web Site" will open. On the left side, select Templates > Visual C# or Visual Basic, and then choose “ASP.NET Empty Web Site” Template from the list of templates. At the bottom of the same window we choose "Web location" for our project. We can choose between File System, HTTP, FTP). I used a File System. Choose the location of the project and Click OK.
A new project will be created. In solution Explorer, you will notice the project will be empty except for a single file named web.config. This file is a configuration file for ASP.NET web application. 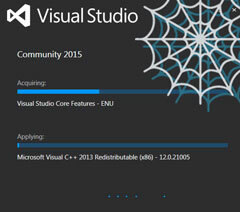 We won't use ASP.NET here, but we still need web.config file to have debugging enabled. First we will add a new HTML page. An "Add New Item" window will open with different items to choose from. Select "HTML Page" and give it a name index.html. The created HTML file will contain basic HTML elements. Now let's add a CSS file. We will add a few styles in it to make the page look better. Repeat the steps as before, but at step 4, select "Style sheet" and let's name it style.css and Click OK. The created file will contain a <body> selector with no declaration. And now a few words about Debugging. So let's begin adding the necessary code to the files we created. Here we have an HTML input text element. The id attribute of the element is used inside hello.js file. Here we have an empty <div> element that is used as a placeholder. Code inside the hello.js file will append the resulting message inside this <div>. Note: We can also add the above code by simply dragging the hello.js file from Solution Explorer into the opened index.html file. Now let's turn our attention to the hello.js file. Here, we created a function named ShowHelloMessage (lines 1-4) and that function is then referenced in line 5. Let's examine this in more detail. We use getElementById function that will return the element with the id=”myname”. In our case, this will be a textbox field from index.html. We use this variable in the next line ( name.value ). Now we use the getElementById function, which returns an element with id=”hellomessage”. This is the id of the empty <div> element inside index.html. We use a innerHTML property on this element to insert a "Hello, " text and also a value of name.value, which contains a value of the textbox from the line 2. The getElementById returns the element with the id="mybutton", which in our case is the button. We pass our ShowHelloMessage function to button's onclick event handler, so that when the button is clicked, this function gets executed. With the above code, the "hello message" is displayed only when button is clicked, but not when enter key is pressed. Let's fix that next. The code inside the onkeydown event checks if enter key has been pressed and if so, click() method is called on our button. The click() method is used to simulate a click event. And we are done. Now, if you simply press enter key after typing a name, it should have the same effect as if you clicked on a button. You can also drag and drop the style.css file inside the opened index.html file and the above code will be created by Visual Studio automatically. Note: To learn more about CSS, getting a dedicated book might be a good idea. if you are a just starting to learn both CSS and HTML I would suggest getting Head First HTML and CSS: A Learner's Guide to Creating Standards-Based Web Pages book. On the other hand, If you already have some knowledge of HTML, but want to focus on CSS, then CSS: The Missing Manual would be a better choice. Which IDE do you prefer? Drop a comment and let us know. I've tried it without this code, and it doesn't work as I'd expect it to, so this code is obviously doing something; but what exactly it does is still unclear to me. Why don't we want the enter button to simulate a "submit" event? Isn't this exactly what clicking on the "submit" button would do? Why do the two mechanisms work differently without the above code? I'm glad you have found this tutorial helpful. You solved my problem with VS, thx. Good catch. I didn't mention anything about CSS. I have now updated the article.